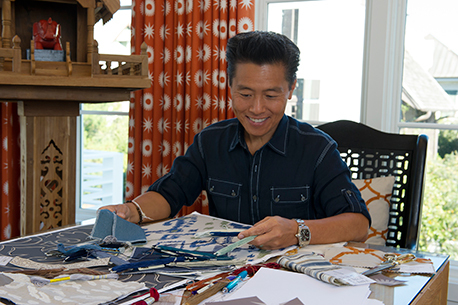 Inspired by his world travels and background in architecture, interior designer and HGTV personality Vern Yip to creates an eclectic and inviting collection of fabrics and trimmings. Vern Yip's global aesthetic, paired with his precise and clean lines, has set him apart as a leading trendsetter. The environments he creates are always warm, timeless, and effortlessly livable. Vern's extraordinary technique, dynamic personality, and sophisticated style have made him a nationally acclaimed interior designer, columnist, and TV superstar. It all began with his Atlanta design firm, Vern Yip Designs, where he still works with clients from all over the world till this day. Vern's interior design work has been award-winning, including the prestigious 2000 Southeast Designer of the Year, and he has been prominently featured in countless interior design and media publications. Most known for his TLC show Trading Spaces and his various HGTV shows including HGTV Design Star, Deserving Design, HGTV Urban Oasis, and Live in Vern's House, and his columns in both HGTV Magazine and The Washington Post, Vern continues to provide invaluable insight into creating environments that are simultaneously beautiful and functional. Stay tuned for more from Vern Yip. HouseFabric.com carries the entire collection of Vern Yip fabrics. Click here to see behind the scenes videos about the inspiration of Vern Yip Fabrics.